Ladies, this one’s for you. Join us March 18 for a panel discussion about women’s health. We’re bringing together three of the best women working in healthcare to answer all your questions. Whether you’re wondering about hormone balancing, stress management, pelvic floor exercises, cholesterol and heart health, risk factors exclusive to women, postnatal life, perimenopause/menopause or when to get a mammogram, we’ve got you covered. 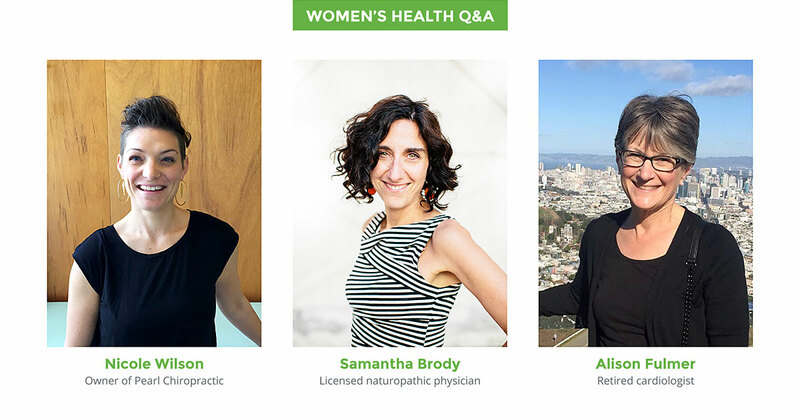 Join us March 18 for a panel style Q&A featuring chiropractor Nicole Wilson, naturopath Samantha Brody and retired cardiologist Alison Fulmer. Come with your questions or send them confidentially in advance. Dr. Nicole Wilson is the owner of Pearl Chiropractic. For more than a decade she’s used her uncommon approach to chiropractic to help her clients move more efficiently and live better lives through deep orthopedic massage and mobilization. She looks at the body through a holistic, wide-angle lens that includes not only joints and soft tissue but also the underlying organ systems. Her passion is contagious and she shares her generous spirit and quick wit with each and every patient. Dr. Samantha Brody is a licensed naturopathic physician, acupuncturist, and owner of Evergreen Natural Health Center in SW PDX. She also works virtually with clients across the globe. When she’s not seeing patients and clients, you can find her speaking and writing on women’s health, stress, nutrition, and integrative medicine. She has been a featured expert in many publications and blogs including the Wall Street Journal, Shape, Livestrong, Huffington Post and more. Her book Overcoming Overwhelm: Dismantle Your Stress from the Inside Out is forthcoming with Sounds True Publishing and will be available 1/1/19. For news, resources and quick healthy recipes connect with Dr Samantha on Facebook and Twitter or sign up for her free 7-day energy infusion HERE. Dr. Alison Fulmer is a recently retired cardiologist who spent many years sharing her wisdom with the patients at Kaiser. She now gets to spend her days traveling the world to see her adult children and ride her bike. RSVP: Guest registration link via PayPal. Hyatt Training members, please contact us to register and save your spot! At Hyatt Training you’ll find more than just a good sweat. Our core values guide each decision we make every day. We’re dedicated to building community and providing education about health and wellness for both our clients at Portland at large. Our annual speaker series gives us the opportunity to do both. To learn more about what we’re all about, how we could help you, our dream team of personal trainers, email us at Go@HyattTraining.com.